There are other processes involved in damaging our teeth that have nothing to do with tooth decay, infection or bacteria. 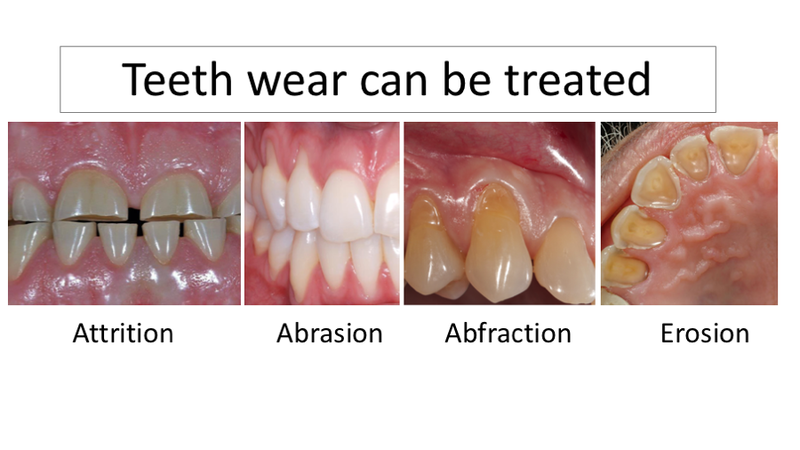 These are attrition, abrasion, abfraction and erosion. Let’s take a close look at what these conditions to see how they differ. Tooth wear increases with age. For all age groups, males had a higher prevalence of tooth wear than females. Attrition is the progressive loss of the biting surfaces of teeth caused by chewing or grinding between opposing teeth. The extent of attrition will depend upon the use to which an individual puts their teeth. For example, it will increase in people who habitually clench or grind their teeth (a condition known as bruxism), e.g., during sleep. It will also tend to be more pronounced in people who eat a particularly fibrous diet. It is typical for attrition that no outside or foreign object is involved. The effect is visible only on the biting surfaces of the back teeth and incisal edges of the front teeth which generally become flat over time. Abrasion is the progressive loss of the tooth surface caused by mechanical actions other than chewing or tooth-to tooth contacts. 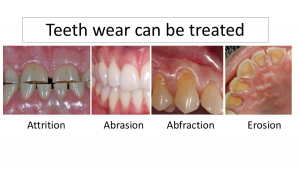 Abrasion is commonly associated with incorrect toothbrushing technique, giving rise to notching at the junction of the crown and root of teeth. It will also be seen in individuals who use their teeth as a tool (e.g., to remove bottle tops, to hold pins, clips or nails). The long-term use of tongue jewellery also causes tooth abrasion, when the jewellery is hitting against the teeth. Other external objects that are likely causes are lip piercings, cracking nuts, chewing on pencils, fingernails, tobacco and so on. It is therefore likely to occur on the outer or buccal side of the teeth where the objects come into constant contact. In other words, it is caused by harmful habits and is not a natural occurring process. Abfraction is a mechanical loss of tooth structure that is not caused by tooth decay, located along the gum line. This is a process in which the abnormal load created by bruxing is the main causative factor. But this is unlike attrition which is also attributed to bruxing, where direct friction or rubbing leads to loss of tooth structure at the occlusal level. The main impact of the loading in abfraction is at a different location from the point of contact. Here, the pressure causes tooth flexure which in turn leads to flaking of the enamel at the neck of the tooth instead of the biting surface. It is normally observed at the buccal side of the teeth near the gum line, where the enamel is at its weakest. Erosion is the progressive loss of tooth substance by chemical or acid effects on teeth and no bacteria are involved. Erosion of tooth surfaces is mostly the results of too frequent or inappropriate use of fizzy drinks (including sparkling water) and fruit juices with high levels of acidity. This habit would appear to be particularly common amongst teenagers and young adults. Erosion is also a problem in individuals who suffer from gastrooesophageal reflux disease (GORD) or from certain eating disorders (e.g., anorexia, bulimia). In addition, risk of erosion is high in individuals with a low “unstimulated” salivary flow rate. How can I prevent my teeth wearing excessively? – Avoid excess dietary acid intake – minimal fizzy drinks and no more than 1 glass of fruit juice per day. Taking acidic drinks through a straw helps to keep the acid away from the teeth. – Visit your Dentist regularly for monitoring and advice. Your dentist routinely monitors your teeth for signs of excess wear. They will question you on your dietary acid intake, any habits you have such as nail-biting, and your tooth-brushing technique. This will allow them to properly assess your risk for excessive teeth wear. Visiting your dentist regularly will enable them to spot the signs of excess wear long before you are aware of it. Book a consultation now for more information on how we can help you with Teeth Wear.